Congratulations to all the Secondary School Heads and SHS School Coordinators for your efforts during our Provincial Caravan/Forum. Congratulations as well to the Municipal Mayors and their representatives with their excellent support to our Senior High School. Thank you to our Provincial Governor Hon. Sharee Ann T. Tan for the never-ending support, SP Member Bebot NAcario, to Rolando Juanillo -Provincial Director of TESDA, Anita Taran,- Provincial Director of the Department of Agriculture, Engr. Meilou Macabare of DTI, Joey Tan of Samelco II, Nimfa Quirante of PIA, Marvin Piczon – Provincial Tourism Officer, Alejo Quitalig – Supervising Administrative Officer of the Province of Samar, Vernie H. Yu – PTA Federation President, all barangay chairmen, PTA Officers, Teachers, business partners from all over the Province of Samar, from all of us in DepED-Samar, thank you very much for your participation! To Dave Quilang, Ivy Yasis from the Central Office, Director Luisa Bautista-Yu, Dr. Gertrudes Mabutin, Dr. Aly Yman and party, Dr. Rhodora Sison and party, Mark, all from Regl Office, Sir Tito Eco and Edgar Tenasas of Catbalogan City Division, thank you very much for your time here in Samar. This map contains the Senior High School location in its specific site coordinates and significant data of each respective school. 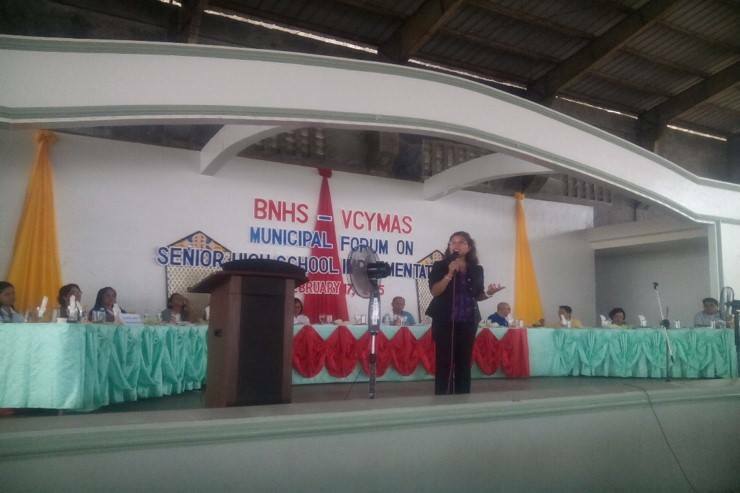 Basey NHS participation during the Senior High School Caravan on october 13, 2015 with jinky villar, Bnhs SHS coordinator, Hon. Genith Cabantac, SB member, jennylyn adona, principal OSNHS and Melinda Tabucao, principal of BIS. DepEd Samar Senior High School group is an advocacy initiative of the DepEd Samar Division to collect and disseminate information, updates and create an impact to teachers, students, community leaders and stakeholders on current developments of Senior High School in the Division. It is with ardent hope and expectation that the full implementation of K to 12 for S.Y. 2016-2017 will be a success.